Advocates of the distributed ledger blockchain technology regard blockchain as one of the best methods for securing transactions, so let’s examine this technology to get a better understanding of why they assert this to be true. Blockchain, as the name implies, is a series of blocks that archives data in hash functions using a timestamp. This method makes it impossible to change or tamper with because, each block in the chain is connected to the one prior to it and the one after it. This makes it virtually impossible to overwrite the data. For any hacker to be able to alter any individual data block, they would have to change the block containing that record and every one linked to it to avoid detection. Since there is no central point for cybercriminals to target, it makes data manipulation practically impossible. The essence of blockchain security is that any modifications to the database are instantly sent to all the users establishing a secure record. This on its own may not seem that impressive, but let’s investigate some of the other fundamental components that contribute increased means of security. Cryptography is used to secure all the records on a blockchain. The two most significant functions of cryptography are hashing and digital signatures. Hashing allows for cryptographers to transform huge amounts of data into short numbers that, are difficult to replicate and manually decipher. A digital signature is like our own personal signature and is used to authenticate who we are within the blockchain. These digital signatures are mathematical functions designed to match to a specific wallet. By linking a digital signature to a transaction, it becomes indisputable where the transaction came from and it is impossible, for any wallet to be impersonated by another wallet. Each blockchain network participant has their own private key assigned to them for every transaction they make, this serves as a personal digital signature. Any alteration of a record will render the signature invalid and the entire network, will be alerted immediately of the disparity. Early detection and notification is core to ensuring security and avoiding further damage. Blockchains are decentralized and shared across peer-to-peer networks, which are instantly synced and updated. Since blockchains are not centrally located they have no central point of failure, which makes it impossible to hack from a single computer. The amount of computing power required to access every instance of a given blockchain in order to alter all the records, all at the same time is incomprehensible. The World Economic Forum expects that by 2017 that at least 10% of all gross domestic product will be stored on some sort of distributed ledger. Today there is a push towards increased blockchain technology usage with financial institutions, governments and private industry adopting it with the goal of addressing challenges related to digital transactions including data security, cross border transactions and fraud to name a few. 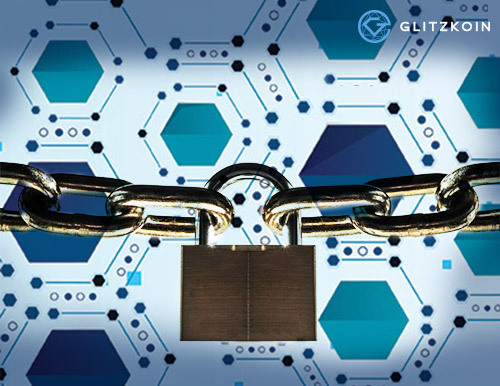 At GLITKOIN we recognize the advantages of security of blockchain and are developing a state of the art diamond blockchain platform for the diamond industry. The project also includes the implementation of a crypto currency.